We take you and your time very seriously. We know you are reaching out to eCommQuest because you have an urgent or future need where our expertise, methodology and resources can be a key part of the solution. We are ready to react to your request whether it is a complex consulting project, long-term support, single urgent position or if it is discussing your long-term personnel strategy for your entire IT organization. Before we work with you, rest assure that we have worked hard to hire the best people- most having Big 4, consulting or IT services experience prior to getting into the staffing industry. We also have invested in state-of-the art CRM, applicant tracking, time reporting and payroll systems to ensure our processes are efficient and accurate. Likewise, we focus on a rather narrow sector of the staffing/recruiting world which has enabled eCommQuest to develop a proprietary internal database of screened and proven resources. The core of our business is providing you with a flexible workforce of the best and most experienced resources in IT, accounting and finance. Whether you are seeking a junior developer or senior Program Manager, our Account Managers will work with your team to understand your requirements, rate expectations, travel logistics and anything else that might make this position unique. We will then quickly find the best available candidates starting with our internal database of proven resources. Of course we also can utilize various external resources and social networking if necessary. Once the candidate is screened, we will start reference checking. If the candidate is a fit for your requirement, we will present the candidate’s resume, our comments, availability and rate for your consideration. Of course with most of our clients we have much more than a simple staffing or recruiting relationship. We will work to really understand your business – locations, organization, products and services. Likewise many of our clients have implemented formal supplier management programs. We want to make sure we comply with your guidelines, policies and procedures. And if appropriate, investigate automated interfaces to our time reporting collection and approval systems. We want to make sure we make your job easier! We will meet with your Project Leads or Department Managers to discuss future anticipated projects, corporate initiatives and related resource requirements resulting in possible gaps in your existing workforce. We will be happy to provide our insight into availability of certain skills and associated market rates. The sooner we know about a need, the better we can react and provide you with the best options. 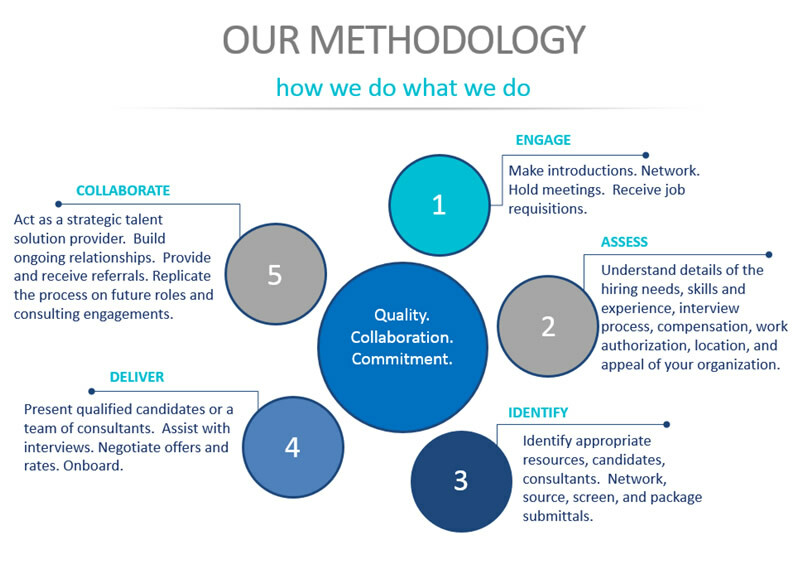 We develop unique ways to add value, reduce costs and improve the overall staffing and recruiting process. Our size and ownership structure gives us tremendous flexibility to be creative in developing new ways to work with you. Examples of our extended services include: proposal assistance or joint participation, project/workforce planning, performance assessments, volume discounting, bonus on delivery, retention bonus programs, on-site Resource Managers and pre-training for core teams.